Delta State Governor, Dr Emmanuel Uduaghan has described the death of ex-Governor Olusegun Agagu as very sad and unfortunate, while eulogising him as a loyal party man whose contributions to the ruling Peoples Democratic Party (PDP) and the nation would remain indelible. In a statement issued in Lagos by Felix Ofou, his press secretary, the governor also noted that Agagu was a calm and easy going politician who ensured that peace reigned in Ondo State, even in the face of stiff resistance from the opposition. 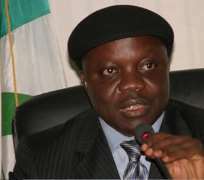 Governor Uduaghan recalled that Ondo State did not descend into political anarchy, neither did the state transform into a theatre of war as a result of the context for power that saw the deceased losing his seat as governor. “Politics for him was not a do or die”, he noted. The Delta State helmsman similarly saluted the former governor’s immense contributions to the growth and stability of the PDP, while lamenting that the death was coming at a time when his wealth of wisdom and experience was most needed. He commiserated with the late Agagu’s family, the government, the PDP family and entire people of Ondo State on the unfortunate incident and prayed God to grant them the fortitude to bear the loss.